Window cleaning business is a seasonal business. Most of the work happens between the spring and fall seasons. In spring, people like to complement their spring-cleaning with clean windows. And, the fall is a popular time prior to the start of the school year. 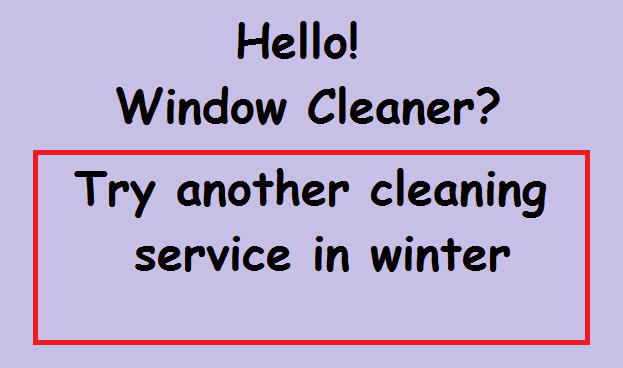 During winter, it’s uncommon for customers do get windows cleaned. The cold weather and general hassle is enough for customers to want to postpone it. So, most window cleaning companies experience a scarcity of work. Even though window cleaning business is seasonal, your services don’t have to be. You will find some great work if you offer additional cleaning services. Year-round and always in demand services — such as gutter cleaning, power washing, or screen/blinds cleaning, for example– are great alternatives. With these additions, you will keep your window cleaning company busy; maintain your cash flow year-round, while expanding your areas of expertise. Your employees will also appreciate a stable income as well. Homes and businesses need their gutters cleaned regularly. The hazards of clogged gutters include overflowing water, mosquitoes from standing water, and damage from flooding or ice. Older homeowners, who can’t climb ladders, also prefer to have professionals take care of it. Since most homes experience clogged gutters from falling leaves and other debris, it’s a necessity– and it’s high in demand. In the winter this turns out to be a lucrative option. If you’ve built a good relationship and reputation with your customers then you should offer gutter cleaning service to them. If they trust your skills with windows cleaning service, then they’ll trust it with their gutter cleaning too. And, they’ll appreciate not having to hire another untested company. Try to “package” the deal with other cleanings for a good price. One of the best benefits of gutter cleaning service is that it’s a year-round service. Not only will you find work in winter, but, you can also fill in the gaps during the regular season too. Most window cleaning companies who offer gutter cleaning service pleasantly realize that they get more work throughout the year. Gutter cleaning is usually priced per hour. Average charge is $50/hr depending on job size. And, if you’re a good handyman, you can also repair gutters for the right price. Most outdoor structure surfaces accumulate dirt, debris, mold, mildew, and stains from normal use. Other times from on-going construction or from the rain or wind. Driveways, walkways, sidewalks, outdoor stairs, patio decking, roofs, and building siding are some examples of regularly soiled surfaces. The best way to clean these surfaces is to use power washers. Power washers eliminate slow labor-intensive scrubbing because they use high pressure water to clean, rinse, and shine surfaces better, quicker and easier. The soiled surfaces are completely cleaned all with just this one tool. This is another additional year-round cleaning service that window cleaners should offer. Window cleaners can invest in a power washer for year-round home cleaning services. They are relatively inexpensive. You can also use them for your gutter cleaning service, too. Power washing is usually priced per hour with an average $150/hr depending on the size and severity of the cleaning. Providing blinds and window screen cleaning should already be something that you normally do. But, it’s also a great option during the winter slow-down. Most times you can go out to your customers to clean their blinds or screens. It’s good for small or large scale work done in or outside the home. For bigger jobs (like offices or buildings) you will collect blinds or window screens and bring them to your location (warehouse) to work on. You can’t clean it in place because you can’t disturb businesses or occupants there. You’ll have to send workers out to remove blinds or screens and truck back to your cleaning center. After cleaning, you’ll send them back and re-install. Your entire window cleaning staff keeps busy and works constantly similar to an assembly line. This is a good option to keep safe and warm indoors while still having plenty of work. Marketing and research is essential for development of your window cleaning business. But, for window cleaners it’s sometimes an overlooked aspect. Take the winter’s slow-down as an ideal time to begin expanding into different areas of work (like the recommendations above). It’s also a great time for research and advertising. Target newspapers ads, cause older customers prefer to still read newspapers. You can do Internet marketing to seek younger customers. It might also be a good time to finally make your cleaning business website. Why not advertise that you now do gutter cleaning, power washing or blind cleaning? Expand your knowledge on new window cleaning equipment, new methods, support forum websites, and offer your cleaning tips and advice to new comers. Get active and find out the latest buzz in your industry. Was there a new squeegee you wanted to try out? Or a better Water Fed Pole system that caught your eye? You’ll find great online window cleaners communities. Your efforts now will only make you better at what you do and make your business more profitable. Aside from the recommendations listed above, there are still many more opportunities for window cleaners in winter. These services are good alternatives because you already have all the necessary tools and experience from window cleaning business. Tapping into other cleaning sectors is just what can get your company in shape during the winter. But, as most companies soon realize, that these cleaning services also are in demand year-round. So once you begin to expand, you’ll be expecting lots of work. This article provided by Window Cleaning Site. They offer tips, tricks, recommended products and great advice on products or methods. Check it out to enhance your DIY or professional window cleaning experience. Prem Kumar, former window cleaner, has several years of experience. He helps his father run and operate a window cleaning business in New York. Created window cleaning site for all kinds of window cleaning resources: DIY or professional.